Went with a friend to dance last night, and I am super sore. Slept in, too, so it’ll be a late night tonight, but it’s that good kind of pain when you’re bumpin’ and groovin’ and shakin’ it. The thing is, the dance is “Zumba” but it wasn’t. Not really. This was extraordinarily organic, fluid, and incorporated hip-hop, too. And I loved it. The class instructor is named “Monica,” and she’s an inspiration. Dropped 77 pounds and cured herself of Type 2 Diabetes. But what was really noticeable to me, were the people in this room. All colors. All shapes. All sizes. All ages. And it’s been a while since I’ve gotten that. My local gym, being a smaller room as opposed to a giant center, gets that, too. And it’s the way I want to groove and move, because when I’m not surrounded by super-fit hyper-marketers — then I have more fun. I guess there’s a ton of other women that agree with me, too, because that’s pretty much all I heard. Down with the super-fit hyper-marketing to make me feel bad about how my body is shaped now. Up with the positive reinforcement to move how I want to on my terms, and be motivated by somebody who’s enthusiastic without ramming sales pitches down my throat. I suppose I could, once again, provide my lamentations that while I love, love, love fashion as art in all its forms — Size 12 should not be considered the XXL on the runway. But that’d just be silly. ‘Cause then I’d just be beyootching instead of doing something about it and I am, in my own way, by dressing the way I want to and incorporating fashion where it’s appropriate. Just nice to be able to find a place to dance that way, too. Work-Out Minutes Logged Yesterday: 60. SERIOUSLY. SIXTY! 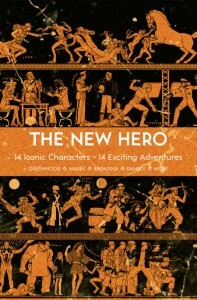 Today, I am pleased to announce that both New Hero Volume 1 and The Lion and the Aardvark, Aesop’s Modern Fables are available for purchase in the US. The first anthology includes a detective noir story titled “Fangs and Formaldehyde” about a vampire named Atlas who will die if he gets too emotional. 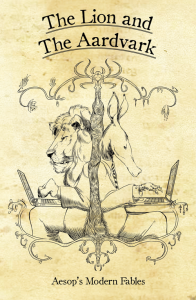 “Bored to Fu,” a modern-day fable about a mouse, a dragon, and productivity, is featured in the second collection. You can buy both books, in print or digital, direct from the Stone Skin Press website. If you have questions about other places to purchase them, drop the publisher a line. Not taking the full-time Marketing Director position with Steve Jackson Games down in Austin, Texas was a tough decision and it left me a little sad (everybody there is just fantastic and ridiculously talented) yet curious about where to go next. (Previously, I was telecommuting and traveling a lot.) When I realized I’d go back to full-time freelancing, I took a look at what my core business will be. I did not want to “leave” gaming nor did I want to “stop” consulting or writing or cat herding. I like working in the creative industries and enjoy seeing projects through to completion. Before I took on any more freelancing, I righted my wrongs. e.g. I had to get back into the discipline of writing for long periods of time again, and that meant I had shift gears dramatically. I also launched The Thirteen and we’ve been grooving and jiving for a few months now, too. That’s had a positive impact, overall. Once I got back where I needed to be, which is approximately 2,000 to 5,000 words on average, I pushed the business aspects forward beginning in January. Everything you see here may seem like a ton, but remember — many of these are smaller, a couple-hours-a-week, projects and you’re catching the notifications of these announcements either after the fact or in mid-stream. The financial reality of being a writer can be *ow* — which is why I’m consulting for select clients based on an hourly or flat rate. Namely, John Kovalic, who I’ve been working with for over a year now, and Onyx Path Publishing, the official licensees of White Wolf Publishing. When wearing my consultant hat, I’m typically invisible. It’s part of these part-time gigs. I’m pleased to say that I was heavily involved with making ROFL! a reality and getting Kobolds Ate My Baby back off the ground. ROFL!, which was designed by John and published by the excellent folks at Cryptozoic Entertainment, will debut in March. 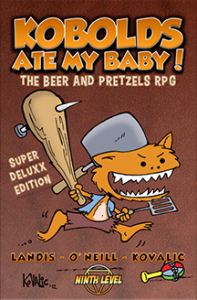 Our friends at 9th Level Games will also be launching a Kickstarter on March 4th for a brand new edition of Kobolds Ate My Baby. For Onyx Path, wow… Well, let’s just say that there’s been some serious discussions and a lot of progress made behind-the-scenes. I just started this part-time job in early February and we’ve talked a lot about fans, GenCon, and [redacted]. Since I occasionally freelance for the company *whistles innocently about [redacted]* I “get” White Wolf. There’s the joke in the industry about the White Wolf freelancers, right? We drive gold-plated Cadillacs, drink to oblivion, partake in recreational drugs — we’re the “cool kids,” living the life, swimming in money. Um… Okay, while some of that may (or may not) be true, the message here is that it’s too early to announce anything — but we’re working on wrangling several pieces while Rich focuses on producing games and fulfilling Kickstarters. I’m open to discussing smaller consulting gigs, but I’m not taking on any other long-term clients right now. I’m heavily focused on what I can provide creatively and leverage my years of experience to consult, primarily so I can continue to write. I’m reluctant to talk about what I’m working on (or with whom) right now, just because of my history with projects not coming out or businesses folding or goals changing, etc. There’s projects that sometimes get buried and then return from the dead — zombie projects!!! — which can bork expectations. What I can confirm, is that I am freelance writing again for games. The Cortex Plus Hacker’s Guide Kickstarter just ended and I sent in bonus material for my essay “Roleplay Like You’re On TV.” Margaret Weis Productions and everybody I’ve been working with has been fantastic. I’m very proud to be part of the Firefly RPG team and will have an announcement soon about my role with that. I want to launch a Kickstarter for The Queen of Crows RPG, but I’m still waiting on other people right now. There’s been some “hurry up and wait” related to that and there’s some concerns I, personally, have on the back end. I’m on deadline right now, meaning I have a few <20K pieces to deliver for other game lines by the end of March, so this isn't as high of a priority right now, and I'll likely push this back to the Fall. In the meantime, I'm going to focus on creating what *I* can in my spare time. Everything I do for The Queen of Crows RPG is on spec, so I don’t count that toward my core business, but… I care very deeply about making this game happen. This is the game I want to make, distribute, and get out there into the world. Badly. 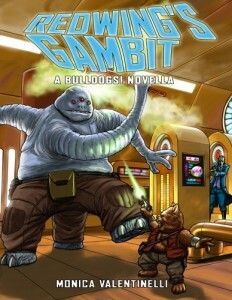 I made some headway on short storytelling last year and I was hoping the second novella I published, Redwing’s Gambit, would serve my goals for a book deal, but it hasn’t been “officially” released yet from Galileo Games. I have print copies if you want them. Just give me a holler on my contact page and we’ll work out a deal. Right now, I’m kicking back and focusing on narrative prose that will sparkle in novel and novella form. More than that, I cannot say, but this will be a longer release/announcement cycle than anything else I’m working on this year. So that’s it for Progress Report #1! To This Day of Evil Days. Sort of. Morning! Yesterday, John “The Muskrat” Kovalic and I contributed two lots for the Evil for Crestline elementary school charity auction. The Valentinelli Fiction Sampler Pack is worth about $75 retail — maybe more? Because ALL will be signed. Hee. Included with three anthologies and two novellas, you’ll also get a $20 gift certificate to DriveThruFiction.com. John’s Dork Tower trade lot includes the first three trades from the Dork Tower webcomic — worth retail $60 and a lot more signed! The auction ends Monday, February 25th, so bid now! I promise, you’ll be VERY spoiled. On a more somber note, winter has not yet released its icy grip on our fair city. I’ve been oscillating from cabin fever to productivity back to feeling a bit trapped by the weather. Adding another layer to my routine this week; I’m in a pseudo-artist recovery program designed to buff up some of the long-neglected aspects of my artist talents. And, that’s yielded some interesting results so far. Definitely venturing off into newer territories and whatnot. So, yay! Remember when I mentioned the purse conundrum? 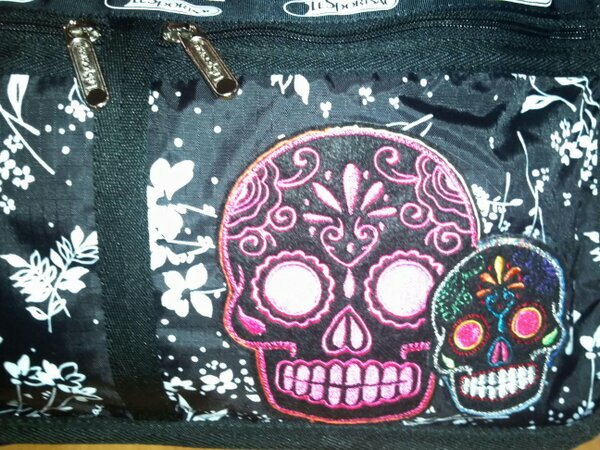 I wound up modifying a Le Sac and I love it now. Very, very light. Very light. Hate feeling bogged down by purses. Before I go, I just wanted to mention that the more time I spend getting to know you, the more I see how common is to be hurt. Even if we don’t acknowledge it, many of us have been bullied in some way. It’s common to seek validation. To vent about it. To declare what our problems are to the world. It is uncommon to use that pain and turn it into an inspiration. To do something about it other than say “Hey! Over here! I’m hurt!” Yes, you’re hurt. Yes, you’re in pain. Hence, the reason why today I’m sharing this video with you. Powerful message and a fantastic, absolutely fantastic example of how one artist took his experiences and channeled his art into a message for bullied kids. I hope this inspires you to do something today. Whether that’s for yourself (you’re worth it!) or for someone else (they’re worth it, too!) go forth and DO. For more information, check out tothisdayproject.com/. Work-Out Minutes Logged Yesterday: House cleaning. Grr. Today, Margaret Weis Productions announced that the company acquired the license to the Firefly television series by Joss Whedon, and they’ll be publishing a role-playing game based on the show. Margaret Weis, who’s written many fine books herself, will be part of a stellar team that’ll work hard to produce this game for you. Some faces, like Cam Banks and Amanda Yahner-Valentine, may be familiar to you. Earlier, the news was also leaked that I’ll be part of this project, too. I’m thrilled to be part of such a talented team and am still a little dazed from the success of the Cortex Plus Hacker’s Guide Kickstarter. Oddly enough, my essay titled “Roleplay Like You’re On TV!” will help those of you who love Cortex Classic who want to play a contemporary style of dramatic role-playing game using Cortex Plus. This new project also carries with it a strange synergy for me, too. You see, Margaret’s series titled The Death Gate Cycle, which was co-authored with Tracy Hickman, is one of the first times I fell in love with a fantasy series and served (no pun intended) as a gateway to other series in that vein. To be working with her is a big deal for me. I’m happy she’s involved in this project and flattered I’m included. More than this, I cannot say. But there’ll be more news coming on this. That, you can be sure of. After all, there’s no better place in the ‘Verse, than at your gaming table.